I’ve received physical therapy twice (because I’ve dislocated a shoulder two different times). Problem: I dislocated my shoulder during a skateboarding accident (approximately 1996). It hurt. My friend Paul drove me from our makeshift skate park to my parents’ house. My parents took me to the Emergency Room. Treatment was probably expensive. My father paid co-payment for my trip to the Emergency Room and for my Physical Therapy. What was the outcome from the E.R.? The nurse (who was my cousin) cut off my favorite “I’m special,” skateboarder shirt. My parents had to leave the room I got my shoulder popped back in by the doctor. I got meds (to help ease the pain and relax my muscles). And I discovered that I’m in the small percent of people who have the opposite reaction to the meds. Codeine didn’t relax me. I was WIRED for days. 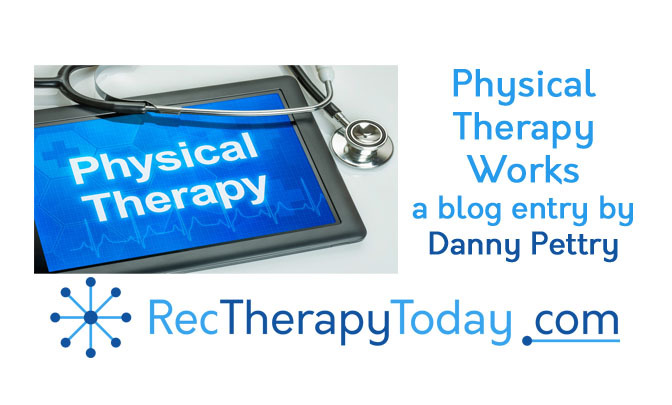 What was the outcome from Physical Therapy (PT)? The Physical Therapist had a tool to measure the range of motion of my arm. It was less than an inch. I couldn’t move my arm. I was disabled. I received PT daily for two weeks. I thought P.T. meant, Painful Things. The PT exercise program was painful. It was more of a (no pain – no gain). I got my arm back from this pain-gain activity. They evaluated my progress at the end of physical therapy and were able to give me a percent of increase in range of motion. I’ll never have 100% range of motion again (in that shoulder). I did have about a 75-80% increase in range of motion. It was a miracle. The physical therapy office was filled with thank you cards and letters from people who had similar miracles happen. These people went from (having a short-term disability) and increasing functioning. My problem is; If I go beyond that 90% range, my shoulder slips back out of place. I dislocated it a second time in 1999. I went back to the E.R. and P.T. I’m a lot more cautious now. And of course, Rec Therapy Works too. I’ve never received RT services.